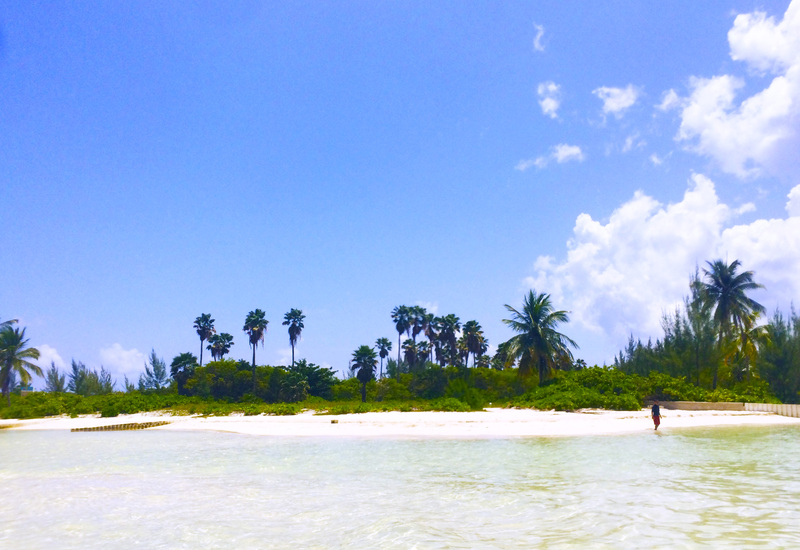 Today we are in the Cayman Islands. Grand Cayman to be specific and Georgetown to be even more specific. This is the port I was most looking forward to, the only port on this itinerary that I had not already been to before. I scheduled an excursion with Soto’s (http://www.sotoscruises.com/) for a two stop tour that includes Stingray City and the Coral Gardens. This tour was $35/per person except KT, who was free but we had to bring our own life jacket for her as Soto’s does not have equipment for children that young, but they do provide both snorkel equipment and life jackets for everyone else. I scheduled the early tour because I did not want to spend any time worrying that we would not make it back in time and have the ship leave without us. I know, there are worse places to be stranded than Grand Cayman but we had reservations in Cozumel that we did not want to miss, so early tour it was. That means early breakfast and early tender since Grand Cayman does not have a deep water pier for cruise ships. Those going on the tour were me, OD, TJ, KT and P. GM and M were going to get off the ship a little later, do some shopping in Georgetown and then meet back up with us when our tour returned to the dock. Or at least that was the plan! The group of us going on the tour got off the ship with no problems, found where we were supposed to meet our Soto’s representative and then fell victim to a pretty common occurrence in the Caymans…confusion over the time difference between the ship’s time and local time. I had done my homework and knew about the time difference, but not everybody had. One couple had messed up the day before and almost got left behind in Jamaica, so they were an hour early for the tour, we were on time, and one family was an hour late. I am not good with late, I am rarely late and it is one of my biggest pet peeves, but I tried to understand that not everyone gets the time change. So we waited. When everyone had finally arrived, we piled into the van for the 10-15 minute ride to Soto’s office where we got our gear and all hopped on the boat. It was about a 20 minute ride to our first stop, the Coral Gardens for some snorkeling. OD broke his ankle in July and he had just gotten the cast off 2 days before we left so the doctor had warned him that while swimming was fine, not to use flippers, so he just had his mask. TJ and I had full snorkel gear and for a bit KT came in with me to see the fishies. The snorkeling was pretty good. Lots of variety and plenty of color to see. The water was clear as only the Caribbean can be and since the Coral Gardens are technically in the North Sound, the water was plenty still and gentle even for TJ at 11 years old. We were the only group there for a bit, then another boat showed up towards the end of our time there but still, it never felt crowded. After a while, we all loaded back in and headed for Stingray City. 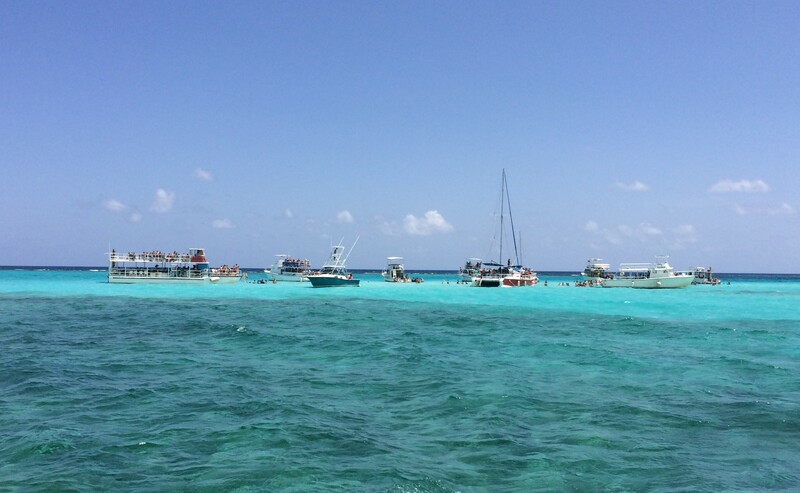 Stingray City is really a sand bar. The water was chest level deep on me and I am just barely 5’1″ tall, so pretty much everyone could stand with no problems. 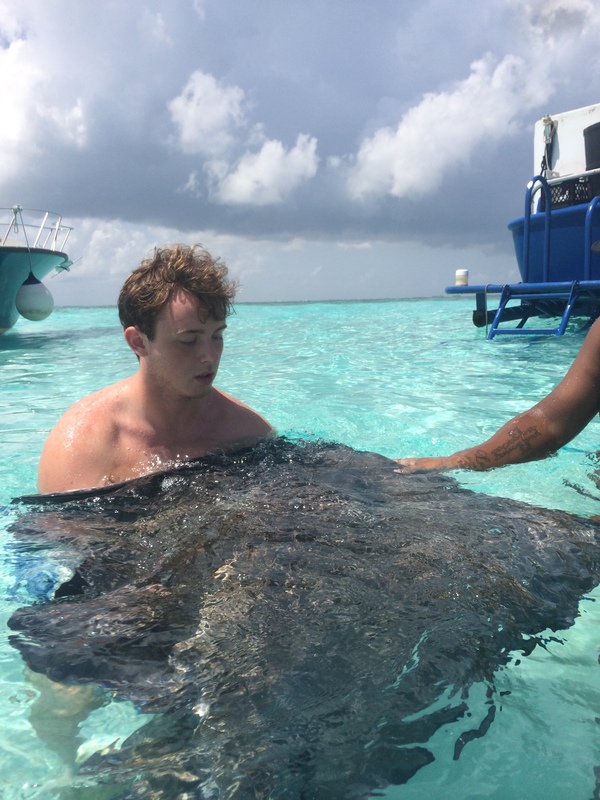 We all piled out of our boat and the captain and mate went to round up some stingrays for us to pet, feed, and for some of us, kiss. 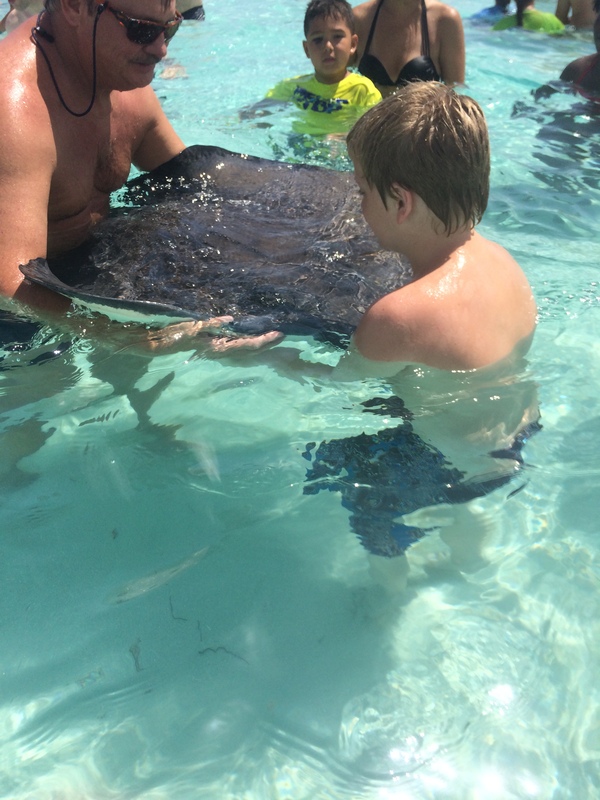 These stingrays are wild, but conditioned to visitors…they know we carry yummy squid treats. We were cautioned to not approach from behind and if the stingray wanted to swim away, to let her go, there would be more. I say “her” because at least for this breed of stingray, the females are the big ones, about four feet across, while the males are much smaller: about 12-18 inches across. This was one of the coolest things I have ever done. To be up close with these majestic creatures, to touch and feed them and have them all around you in the water was just awesome! My kids were awestruck as well, even KT was wowed! It was definitely a bucket list item! We stayed for almost an hour and then loaded back into the boat. That was supposed to be the end of the excursion, but we were given one more “extra” stop on the way back. Starfish Point. As we approached Starfish Point, my immediate thought was that it was one of the most beautiful little islands that I had ever seen. It was picture perfect, although I could not get a picture that I felt did it justice. It is what you picture in your head when you hear of a remote Caribbean Island. Perfect sand, palm trees, clear blue water. There were huge starfish all along the shallow sand, the captain cautioned everyone not to bring the starfish up out of the water and I don’t think anyone did, but my kids were just thrilled to touch the starfish and see these ginormous things! They were up to a foot across and all different colors. I am sorry I didn’t get too many pictures, but KT was refusing to be put down because she didn’t want the sand to touch her feet…sigh. We returned to Soto’s dock and headed back to the van for the drive back to the port area where we were supposed to meet GM and M. However, we were over an hour late (although still plenty of time to make “all-aboard”). We wandered around the port area looking for them with no luck so we figured they had gotten back on board without us, which is exactly what they did and we found them a bit later, no worries. The icing to this great day in Grand Cayman was that the Immigration Office right at the pier will stamp your passport if you bring it to them. They were SUPER nice and now KT, OD and TJ all have stamps in their passports! I really wish all Caribbean nations did this, but so far this is the only one we have had any luck with. I have a bunch more to tell you about day five, but I think I will stop here for now…more to come! Next postFreedom Sails…Day 5 (cont.)! !